This track right here is another such gem. The original Mother Brain theme from Super Metroid was established in 7/4, and when it came time to arrange this, I knew I wanted to keep the meter while at the same time incorporating a genre that doesn't typically merge with it. I'd also been wanting to try my hand at some drum n' bass. This seemed like the perfect opportunity to bring it all together. Sadly, despite the fact that I love checking out new music, I really don't do it often enough. But when I do, if it's a new genre I'll often ask my colleagues who they like in that arena. So it was, I asked who was good in the world of dnb, and the name Dieselboy kept coming up. I checked out his work; it's good, albeit not material I would listen to a whole awful lot. 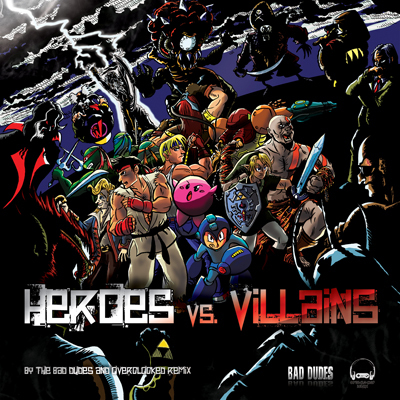 Nonetheless, I listened to a lot, absorbed it, and channeled the style the best I could through my Mazedude brain into a remix that was one of my contributions to the Heroes vs. Villains project. It was... a lot of work. Tackling this style with this rhythm, and also making a short original theme interesting for 4+ minutes, was a real challenge. I'm quite pleased with the end result though, as have been the fans. Nods to fellow tracker RS3 for some of the distorted percussion samples that are featured in this.